Ronald Laes, who lives with his family on Bainbridge Island, is a former Coastguardsman and founding member of the Department of Homeland Security. He has had extensive training in emergency responses to disasters and weapons of mass destruction. In 2005 Laes wrote Surviving Terrorism In America, drawing on his years of training and experience. 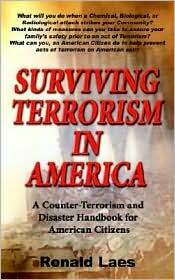 The book helps readers understand and survive the various terrorist threats that face our nation. U.S.P.H.S. Medical Director of Emergency Services Charles T. Mitchell says of the book that it "gives the ordinary citizen the basic understanding of Disaster and Terrorist issues and a practical and easily understood mechanism to protect your family and local community... In writing this book, Mr. Laes has provided a valuable learning tool we should all read."